Cora Lee Riley, 104, of Columbia passed away at Boone Hospital Center on Tuesday, January 15, 2019. She was born on May 31, 1914 in Martinsburg, Missouri, the daughter of the late Samuel F Moser and the late Emma (Klarenbach) Moser. Cora loved traveling, and sports including Mizzou Tigers, St. Louis Cardinals, and St. Louis Blues Hockey. More than anything, she loved her family. Cora will be missed by many nieces and nephews. 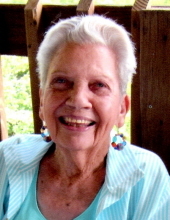 She was preceded in death by two husbands, Sam Santillo and Homer “Joe” Riley; brothers, Cecil “Pete” Moser, Clyde Moser, Warren Moser, and Sam Moser; and sisters, Emeleta Mottaz and Leota Jansen. Graveside services will be held at 11:00 a.m. on Saturday, January 26, 2019 at Auxvasse Cemetery Shelter with Pastor Brad Stagg officiating. To send flowers or a remembrance gift to the family of Cora Lee Riley, please visit our Tribute Store. "Email Address" would like to share the life celebration of Cora Lee Riley. Click on the "link" to go to share a favorite memory or leave a condolence message for the family.